Whistleblower: Cambridge Analytica Aimed To Trigger Paranoia And Racial Biases Cambridge Analytica used Facebook to find and target Americans to trigger paranoia and racial biases, Christopher Wylie, a former worker for the data analytics firm, told lawmakers on Wednesday. 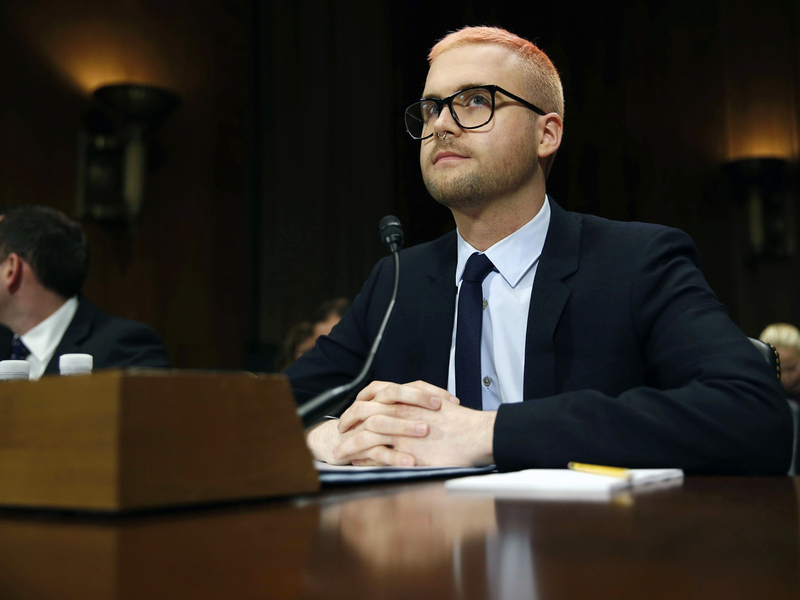 Christopher Wylie, former Cambridge Analytica employee, prepares to testify before the Senate Judiciary Committee on Wednesday. Cambridge Analytica used Facebook to find and target Americans to trigger paranoia and racial biases, a former employee of the data analytics company told lawmakers on Wednesday. "Cambridge Analytica sought to identify mental and emotional characteristics in certain subsets of the American population and worked to exploit them by designing them to activate some of the worst vulnerabilities in people, such as neuroticism, paranoia and racial biases," Christopher Wylie told the Senate Judiciary Committee. Wylie worked for Cambridge Analytica in 2013 and 2014, and he's largely credited as the person who blew the whistle on Cambridge Analytica's indiscretions. He's testifying on Capitol Hill as a part of an ongoing congressional probe into Facebook's misuse of users' personal information. Cambridge Analytica was working with the Trump campaign during the 2016 presidential election. The firm has denied using the information to target voters. Wylie told lawmakers that during his time at Cambridge Analytica, employees of its parent corporation SCL Group were in contact with Lukoil, Russia's second-largest oil company. Lukoil is subject to U.S. sanctions and has been linked to Russian influence operations in the past. Wylie also told lawmakers the SCL Group worked to assess attitudes towards Vladimir Putin in Eastern Europe and complement Russian information operations in former Soviet bloc countries. Cambridge Analytica gained access to vast amounts of user data from its relationship with Aleksandr Kogan, a researcher at the University of Cambridge. Kogan created a personality test that Facebook users could take. As part of signing up, they also gave access to most of their personal data, including location data, every Facebook page they liked and access to all of their friends' profiles. Most users were likely not aware that the fine print in Kogan's survey told them their data could be used for commercial purposes — a clear violation of Facebook policies. Wylie talked about his conversations with Kogan while the two worked at Cambridge Analytica. "What I can say is that the lead researcher, Dr. Kogan, was at the time, working on projects that were related to psychological profiling in Russia," Wylie said. "I can't say for sure that this (Facebook user) data ended up in Russia." In response to more questions about Kogan's affiliation with Russia's St. Petersburg University, Wylie said it would have been "very easy" for the Russian government to obtain the Facebook data he had gathered. Wylie also said that Cambridge Analytica had hired at least two senior staffers who had been aides to the British lawyer John Jones, who represented WikiLeaks founder Julian Assange. Assange is currently living at the London-based embassy for Ecuador. He's a particularly controversial figure in the United States, because of his role in releasing classified documents through WikiLeaks. The hearing comes despite Facebook's public efforts to clean up its efforts on protecting privacy. Earlier this week, Facebook announced it had suspended about 200 app developers for suspicious use of personal data. According to a Monday blog post by Ime Archibong, Facebook's vice president of product partnerships, the company has investigated thousands of apps that had access to large amounts of information in 2014, before the company changed its policies reducing the data that apps could access. Republican lawmakers on the committee repeatedly stressed that data analysis has been used in politics since the 1990's. Sen. Ted Cruz asked witnesses to detail how the Obama campaign used Facebook data in the 2008 and 2012, suggesting that Facebook gave preferential access to those seeking to elect Democrats. "A lot of people are concerned about, for example, the ability of big government to inhibit our liberties and choice. Big data can engineer a situation that limits our choice and our freedom. And it's not a partisan issue," Wylie said. The misuse of the personal data by Cambridge Analytica has heated up scrutiny of Facebook's privacy policies. CEO Mark Zuckerberg went before Congress last month to testify. Wylie has already testified in front of two House committees.